The PSP125ABK is ideal for many applications such as light dewatering, pool covers, sump pump applications, and can be used in salt water. It offers features that are normally on larger, more expensive pumps. 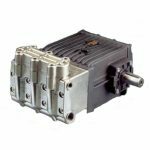 The motor is protected by a heavy duty mechanical seal made of silicon carbide and a lip seal made of oil resistant Buna. The rotor shaft, motor housing and all hardware are made of 304 stainless steel. All other “wet parts” are made of reinforced plastic. A thermal breaker ensures shut-down should overheating occur.